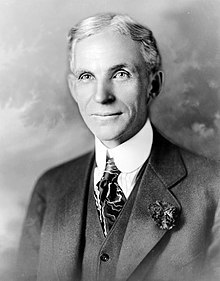 Henry Ford once said “Any customer can have a car painted any color he wants, as long as it is black.” He said this probably due to his commitment to keeping the cost of the automobile down as black paint was cheaper to use and from 1913 on, that is the only colour Fords came in for many years. It’s funny how a great innovator like Henry Ford just couldn’t see that the very people he built his cars for wanted colour in their cars. By being inflexible on this issue, he allowed his competitors to gain a foothold in the industry and take a large chunk of his business. Just recently, Blackberry has been going through a downturn in their business because of similar short sightedness. They felt that their customers were very loyal and didn’t need all of the bells and whistles that the competitors offered. They were wrong. People don’t like to think that someone else has something that they don’t have, even if they have no need or use for that extra something. Unlike Ford however, Blackberry may very well go out of business because they couldn’t change to accommodate the wishes of the customers. Today was overcast and cool, a thoroughly grey day in every sense of the word. You can add to that the fact that I was on my way to see the doctors with the hope that she might be able to help me. I am pretty sure she can’t, and when you get to a certain age, the doctor’s standard response is “You have to expect this kind of thing when you get to your age.” I have the feeling that although I will be scheduled for more tests, they are just to placate me. It was a grey day indeed. So, I set off in this mood and as I was driving I noticed that most of the cars looked the same. They were all grey, black, silver and white. There were some blues, reds and some greens, but those colours were dull and listless. I wonder why we as a society have opted to drive around in dull and boring coloured cars. There is the odd colourful vehicle, but they are either driving kids to school or racing to a fire. Not too many personal vehicles are in the slightest bit interesting colour wise. I can remember when my mom and dad would buy a new car; they would come home with a book of paint chips and another book for the interior. They spent days picking out the colour from hundreds offered and the manufacturer would mix the paint specifically for that car. Once they settled on the outside colour they would have to compliment it with interior colours and materials. There were some pretty unique cars that came from that era. Fast forward a to just a few years ago, I was with a friend who was buying a car and when it came to deciding on the exterior paint job, there was a choice of only five colours. Only five! The interior choices were just as limited. That must be why when I was driving today I felt the cars, pavement and the sky were the same colour, or should I say lack of colour. I hope that there are countries in the world where they use cartoon colours for their cars. It would be wonderful to stand on a hill over looking a highway, watching a rainbow pass before your eyes. No rainbows in Russia. I have noticed that the cars in Cuba are painted like the cars I remember from my childhood. That might be because a lot of them are the same age as the cars from my childhood. Here is a link to Cuban car images. https://www.google.ca/search?q=cuban+cars&rlz=1C1CHRG_enCA487CA487&espv=210&es_sm=122&tbm=isch&tbo=u&source=univ&sa=X&ei=o1hXUvfjBMGZiQLrhoH4Bg&ved=0CEUQsAQ&biw=1680&bih=935&dpr=1 . I guess we have come full circle and have proven Henry Ford correct. The way to keep costs low, you save on the paint. I would like a more colourful world.